Slingers are common in Arabian armies, being levied from the nomadic tribes. These men are mostly lower class herders. 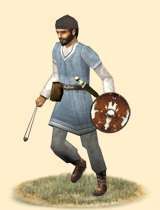 The tribesmen are not wealthy, so they march to war in just their simple garments, a simple shield and their own, often homemade sling, in addition to a dagger for self-defense. In battle, the slingers should be used as light skirmishers, who will rush forward against the enemy to pepper them with stones, only to flee when threatened. These slingers should never be expected to fare well in melee. Historically, slingers seem to have been used in almost all corners of the world in some sort and Arabia was no exception. Slings are very easy and cheap to make, and yet they are a respectable weapon. It is for this reason that they were so prevalent among the poorer Arabian tribes. The Arabian city-states, like Sab’yn levied slingers from the subject nomadic tribes to augment their own armies and these men were drawn from the lower class herders whose only task during peace was to guard the herds from predators. This in return meant they had enough experience with a sling to be a threat on the battlefield.